George Graham Reviews Anna Dagmar's "Let the Waves Come in Threes"
If you're an artist doing original music, the kind of things you listened to growing up obviously plays a large role in what your own music turns out to be, be it folk, jazz, metal or alternative rock. The singer-songwriter genre leaves lots of room within its boundaries, but not surprisingly, most of the practitioners of the style have some folk music in their background, probably growing up listening to earlier generations of folkies. But this week, we have an auspicious recording by a singer-songwiter who grew up on classical music, and whose instrument is the piano, rather than the acoustic guitar. And in the process, she has forged a distinctive and very appealing sound. 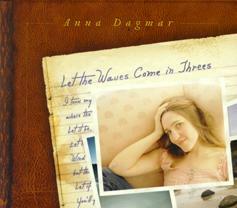 Her name is Anna Dagmar, and her new, third CD, is called Let the Waves Come in Threes. New York-based Anna Dagmar was born in England and growing up, was surrounded by classical music from her father's love of the music, which he kept on the radio, and from hearing the nearby St. Alban's Cathedral Choir. At age 7, she moved to the Boston area, and started on piano, diving into the classics and greatly enjoying them, playing Beethoven, Chopin and the like. She says that one of the things that drew to her the music was the surprises that such music had to offer with shifts of color and the like. Later, at age 14, then got into Joni Mitchell, and also the jazz piano of Bill Evans and Keith Jarrett. She went on to graduate from the Eastman School of music, where she made her first CD in 2001. Now she is out with Let the Waves Come in Threes, which was produced by Ben Wittman, who has worked with people like Patty Larkin and Jonatha Brooke. It features her piano prominently, along with an eclectic backing group that includes everything from a string trio to steel guitar to bass clarinet to a cranked up electric guitar. But there's nary a folky acoustic guitar to be heard. Ms. Dagmar is endowed with a very attractive, clear voice that owes some its influence to contemporary jazz singers, and I am reminded of the sound and phrasing of Kate Schutt, whose album we reviewed last year. But perhaps the most distinctive part of Ms. Dagmar's CD are her compositions, which are full of the musical surprises that drew her to classical music, with complex shifting harmonies, distinctive arrangements to go with them, and rather un-folk-like rhythms. But lyrically, the CD is up with the best of the literate folkies, exploring relationships and making some commentary on the state of the world with poetic language. Some of the people who appear with Ms. Dagmar on the CD include producer Wittman who plays the drums and percussion, Marc Shulman, who has played with Suzanne Vega on the electric guitar, bassists Richard Hammond and Kaveh Rostegar, and cellist Matha Colby. Anna Dagmar's new CD Let the Waves Come in Threes is wonderful recording by a classically-influenced piano-playing singer-songwriter who is not afraid to let the subtleties and multi-faceted layers of classical arrangements, along with the harmonic sophistication of jazz into her music. She's a fine lyric writer, and a very appealing vocalist. It all combines to be more than the sum of its parts for a one of those CDs that really stands out, what I sometimes call an "ear grabber." Our grade for sound quality is an A-minus. The recording boasts excellent, tasteful production, with the acoustic instruments captured with most of their colors intact. But it missed an A-grade due to the usual fallacious music industry group-think pressure to crank up the volume through audio compression, that undermines the music's dynamic range. When she's not performing, Anna Dagmar also works as a classical piano teacher. She has definitely learned her own lessons well, with her excellent musicianship and wide ranging set of musical influences on her new CD. For me, it's one of the best new singer-songwriter recordings of the year so far, in a crowded field.